The Dropa Stone Disks : Sirius UFO Connection ! 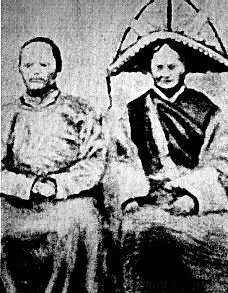 In 1938, a Chinese and Tibetan team of archaeologists led by Chinese professor Chi Pu Tei from the University of Beijing, discovered an astounding burial site high in the mountains of Bayan-Kara-Ula on the border of Tibet and China. The team of archaeologists were conducting a detailed survey of a series of interlocking caves. What they found would provide evidence for this investigation to suggest the impossible. The Chinese and Tibetan team found a grave site containing the skeletal remains of what at first thought to be a very primitive and tiny people with extra-large heads. Professor Chi Pu Tei is reported to have responded, "Who ever heard of apes burying one another?" Or course they were not apes. The team found that the cave area is still inhabited by two tribes that have some of the same physical characteristics. They are frail in their bodies and stand between 3-foot-6 and 4-foot-7 with an average body height of 4-foot-2. The two tribes are known today as the Hans and the Dropas. Then the team found a large round stone disc half buried in the dirt on the floor of one of the caves. 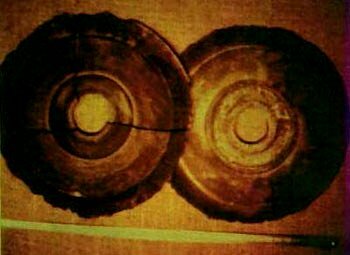 The discs were a record of some ancient event or an artifact of something these ancient peoples described seeing some 12,000 years ago. There are grooves on the Dropa stones that contain ancient closely written characters in a language that would later be translated by another Chinese scientist named Dr. Tsum um Nui in 1962. In 1965, 716 more grooved Dropa stone discs were discovered in the same caves. According to Tsum Um Nui, one of the lines of the hieroglyphs reads, "The Dropas came down from the clouds in their aircraft. Our men, women and children hid in the caves ten times before sunrise. When at last they understood the sign language of the Dropas, they realized that the newcomers had peaceful intentions." The stones go on to say how the Dropa were unable to repair their disabled spacecraft and could not return to their home planet, and so were stranded on Earth. Anthropologists have been unable to categorize either tribe into any other known race; they are neither Chinese nor Tibetan. Both tribes are of pygmy stature, adults measuring between 3-foot-6 and 4-foot-7 with an average height of 4-foot-2, and body weights of 38 to 52 pounds. They are yellow-skinned with thin bodies and disproportionately large heads, corresponding to the skeletal remains found in the caves in 1938. They have sparse hair on their bodies and have large eyes that are not Asian in aspect, but have pale blue irises.